The winning-est BBQ Glaze in a 1 Gallon Jug. For the Competition BBQ Cook. Honey BBQ Sauce. 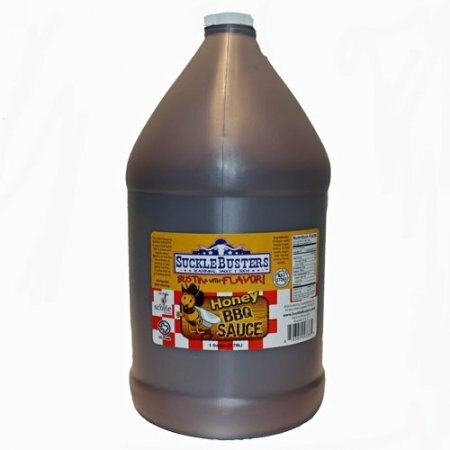 This BBQ Sauce has quickly become the choice glaze and finishing sauce for Competition BBQ cooks. It provides a combination of super sweet glaze, mild flavor and adds a deep red color to meats. The extra honey plus some other special secret ingredients were chosen for their ability to glaze ribs and chicken for Competition BBQ cooks. The sauce is somewhat thin which makes it easy to control and apply to a uniform thickness. Some cooks choose to add their own secret ingredients like (more) honey, butter or even more sugar to thicken and sweeten the sauce. This sauce is winning-winning-winning when it comes to BBQ cook offs. We have many Grand Champions on chicken and ribs. Baste it on the last 15 - 20 minutes of cooking for a perfect finish every time! Ingredients: Vinegar, Water, Brown Sugar, Honey, Tomato Paste, Cane Sugar, Salt & Spices. NO MSG. NO GLUTEN.